There is a point in time in our lives (for many people, several points!) where we come to the realization that what we’re currently doing MUST change, because it’s just not working. This is the realization I’ve come to over the past month. Overwhelmed is a great understatement of how I’ve been feeling. But… my internal chastising doesn’t help how I FEEL. In fact, it just adds guilt to my list of things I’m trying to hurdle over. I struggled with how to write this post. It’s part of the reason that I didn’t blog most of last week. There I was, on Annabelle’s heart day, a day where I should have been (and was) overjoyed… but I was still struggling. A lot. And I didn’t like it one little bit. So I spent the week focusing, for the most part, on getting things done. Marking things off the list (that I keep in my head… I know I should write it down, but seeing it on paper overwhelms me more… and gives me another task to do, keeping up with the list!) and just really praying over what I can do to overcome this not-good-spot that I’ve found myself in. In talking with other heart mommas over the last two years, I think it is something common we all feel, and it’s hard to put into words, and frankly, hard to understand for those looking from the outside. Our kids are getting better. We should be ecstatic and overjoyed and able to handle the smaller hurdles with ease. What in the world is our problem?!? Just because you’ve made it through the “horrific” stuff doesn’t make the “hard” stuff any easier. (Warning, gross analogy forthcoming…) Just because a guy gets his arm cut off by a saw one year doesn’t make getting a toe cut off the next year any less painful. Yeah, maybe it hurts a little less, but it still hurts. So feeling guilt about struggling with “smaller” issues is silly. A struggle is a struggle, and God still wants to be God of that. Hospital vs Home is like comparing a dump truck to a motorcycle. They are a whole different can of worms. YES, I’ll take home over the hospital every day of the week (as long as Annabelle is home WITH me) but they are just different and can’t be/shouldn’t be compared. The hospital is obviously hard. We were there because Annabelle was sick. But… I was also able to leave when I needed a break. I had nurses to give/remind me to give meds, and they’d come check in and help at a moments notice. A cleaning lady came and dumped the trash and mopped the floors and scrubbed the bathroom. Care-partners helped change diapers and change beds. I had a doctor at my disposal 100% of the day, that I could ask questions if I was worried about something. I can plug my ears to the “issues” at home and give 100% of my attention to getting my baby better. At home… I am nurse, cleaning lady, care partner and would-be doctor, as well as physical therapist, occupational therapist, and feeding therapist. On top of those things, I’m also mom to Annabelle and 3 other girls who need my attention very much. I have a husband who works 70+ hours a week and just literally doesn’t have time to help like he’d want. Oh, and I also do this little thing called writing books, and need to focus time and energy on it, otherwise sooner than I’d like, I’m going to be sending out job applications, because you can only extract so much blood from our sickly finances before they fizzle up and die. Yes… hospital and home are very, very different. Please don’t think I’m complaining about being home. This is part of the reason I haven’t expressed my thoughts much on this before. But… it’s just different. And just because I LOVE being out of the hospital doesn’t mean it is easy, or even handle-able. Help is still very much needed. I’ve been trying to do it all myself. I’ll ask for help from my family now and again, I’ve gotten a LITTLE better at that. But I’m realizing that this is my overall frame of mind: God got me through the really crazy stuff… now I should be able to handle the everyday life… right? But God wants to handle our everyday life, too. He wants us to lean on HIM and trust HIM in EVERYTHING, not just the hard stuff. And everyday life, at this point, isn’t exactly a stroll-in-the-park. Fear is still real. I know, I know, we aren’t suppose to fear. 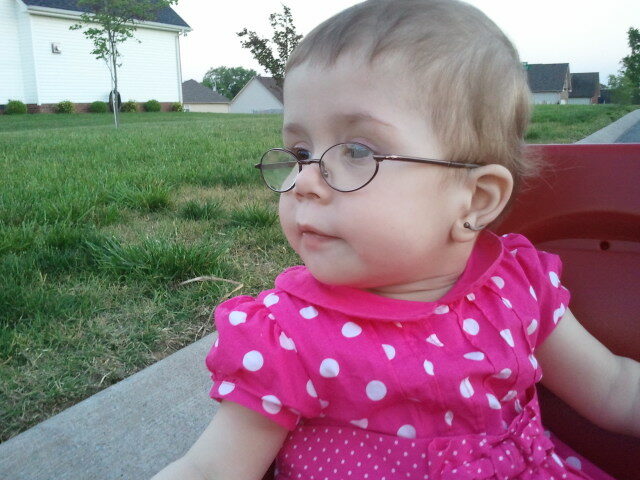 And fear is much different at home than it is in the hospital, especially when she was in critical condition. But it’s still there, nagging at me. I still experience that breathless catch in my lungs when I look at her sleeping until I see her chest rise and fall with a breath. Every time she’s sleepier than normal, my immediate thought is, “Oh my goodness, what if this is it. The start of rejection.” Every cough now makes me think RSV or fluid buildup in the lungs from heart failure. I correct myself fast. I know enough to remind myself that these are all NORMAL the majority of the time. But with a heart baby, there is a never a promise that it will always be normal. 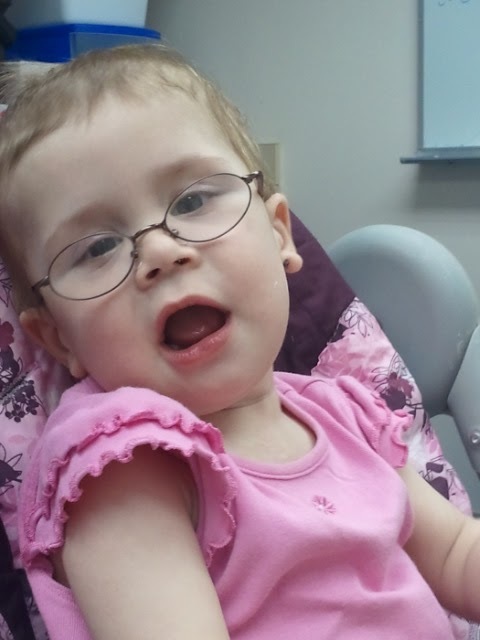 With Annabelle, there is the always the fear of rejection, the fear of illness that her body won’t be able to fight. I have to daily give that fear to God, and really, I do. I’m not wallowing in it. But it wears on a Momma after a while. It makes a Momma tired, and makes her feel guilty for feeling it in the first place. Comparison is from Satan. It is so easy to get caught up in comparing, on BOTH ends of the spectrum. When I see a baby Annabelle’s age or younger doing fabulous, my immediate thought is sadness. Not for me, but for Annabelle. That she isn’t doing those things yet. And, I’ll be honest, a wee bit of jealousy. And when I hear of a heart baby who went to be with Jesus, my heart absolutely breaks. And then I feel a little bit of relief… that Annabelle is still here. And that is followed by a boatload of guilt, for 1.) feeling relieved and 2.) feeling overwhelmed with life when at least I still have my baby. Do you notice a lot of the G word in this post? While feeling guilt can be a GOOD thing sometimes (means you are remorseful for something you’ve done wrong…) it can also be from Satan too. Trying to trap you underneath it and make you immobile. And that’s where I’ve been lately. It’s not just from the guilt… but that has definitely not helped things lately. So… the question is, what do I do to point myself and my family back on the track of sane-living? I’m a big believer that the first step is “recognizing” that there is a problem. I’m at that step. The next step, for me, is to take a big step back and figure out what isn’t working. That’s what I’ve been doing this last week, and I’ll talk more about that on Wednesday. We’ve already taken some pretty big steps toward this, some more pleasant than others. For now, enjoy some pictures!!! Look mom! 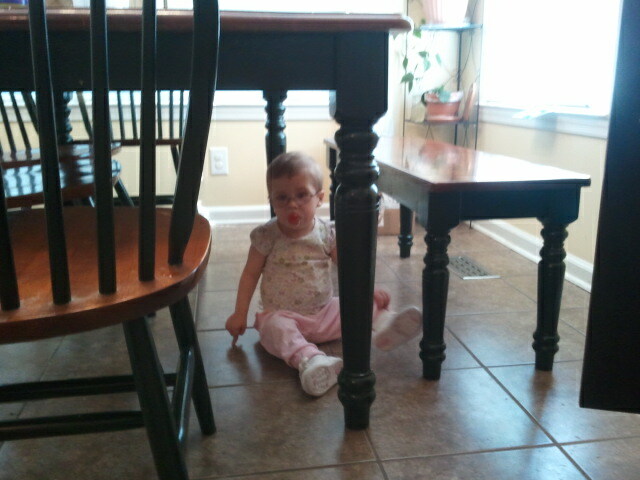 I can crawl under the table! Annabelle is getting VERY curious about things lately… and crawls EVERYWHERE! 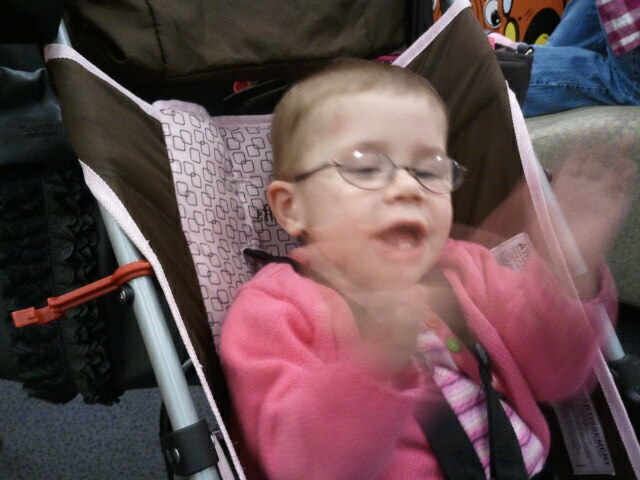 Clapping her hands before PT!!!!! Let me tell ya… she wasn’t clapping afterward…. And this is why… to prep her feet for braces and get her less sensitive… we tried to get her feet used to different textures. Yes, my baby is standing in a bin full of beans! 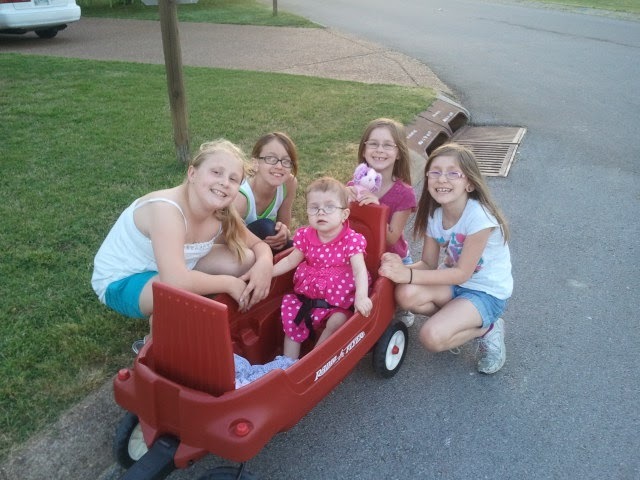 Taking a walk with big sisters and mommy! MAN this is fun! The crew… plus a friend who tagged along! You said what so many of us heart moms think, but don't have the courage to say, for whatever reason. While our kiddos are in slightly different boats, I feel what you're saying and I struggle with it, too. I just attended a visitation for a 9 week old HLHS baby who died suddenly last week, one day before she was set to leave the hospital. Her heart, with no warning, simply stopped working. Saddness, guilt and an overwhelming sense of responsibility all resurfaced. David's heart also stopped working without warning. However, he was still intubated, so he was able to get the oxygen he needed to survive during cpr. I'm thrilled he's still here, but I can't help but ask, why did my little guy live when most others in that situation don't? At the same time I wonder why it happened at all. Before that moment, he didn't have a brain injury, and now he does. I've always likened this world of complex chd's to that of a soldier at war. Some escape unscathed, some are blown up and other's return home without limbs, but all of them are mentally and emotionally scarred. It's hard and frustrating and wierd and full of love and grace all at the same time. Thanks for sharing this with us. It's nice knowing I'm not the only one who feels this way! I am SO wanting to play mom here (and not just because I'm old enough to be yours…). You are WISE, my friend, to see that the stresses of home and family are different but no less intense than the hospital. Like you, I worried every time Rachel slept too soundly, and checked on her every morning to see if she still lived. There's no relief or back-up if something goes wrong. This is an emotional weight few people understand. And when you come home, people are more likely to see your situation as "finished," than as one where you still need help, as much if not more than when you had the hospital to rely on. And you're torn – Annabelle's LIFE is still the center of your world, but you also have a hubby and three other beauties who love and rely on you. Your steps are good ones, and as someone who's walked a similar path, I can see you much farther along (in the wisdom dept) than I was at this stage. Keep longevity in mind. What matters most is what will matter in the long term. Thanks Ramona! You put that so approriately… Annabelle's life has been my focus for a long time, and at home I'm forced to face the reality of all the other things that need my attention too. It's a good thing… because I NEED to give those things my attention… just not a simple thing. Ah, longevity:-) Very wise advice, one I will absolutely take to heart! I have been in the thick of this recently as well. So depressed and frustrated and angry and then guilty for all those feelings. I know there is a problem I just have no way to fix it. I also do not yet know how to verbalize how I am feeling, so thank you for putting yours into words, because it helps me to kind of sort through my own feelings as well. We are never alone in this! It makes zero sense to me, but I feel MORE depressed, frustrated, angry and guilty AFTER we got home from the hospital than while we were there fighting. I haven't firmly found a fix either. I joked with a heart momma friend about getting some (legal) happy pills to bring me to not-crying-everyday-land… and I was only half teasing. I've known a lot of heart momma's who've had to go that route to fight depression once they get home. For me, I'm fighting my best to manage in other ways… haven't figured it out completely yet, but it is my quest!!! While I do not have a heart baby nor a critically ill child, I can so relate to your post. My struggles are with different matters, but struggles all the same. You put into words so well what has been going through my head. Lately, my prayer has simply been, "God, I may not feel it. My emotions may not show it. But, with my heart I choose to trust You." This is such a good point, Kristi. This isn't reserved for parents with critically ill children. The guilt and the struggle can be the same in SO SO SO many different situations! That prayer is beautiful and spot on! Trusting God and following Him is a choice… if we always went on feelings… well, we'd be pretty wishy-washy! I love your honesty and glimpse into your world. Thanks for being vulnerable here. And actually living again … Instead of just going through the motions!! Talk to your doctor!!! I missed your post last week. Thanks for sharing your feelings and hurts. We serve a God that is big enough to handle our pain, trust Him and He will meet you right where you are. Being a mom is a tough job, add a child with medical concerns and your plate is full. Remember God is ready, willing and able to walk with you each and every step that you take on this journey. All you need to do is invite Him to join you. You are a blessing to all of us that read your blog. When I read this post I felt like I had written it myself. I experience what you described all the time. I was shocked and relieved to know I am not alone. I have described it to friends like being in a swimming pool and trying to keep my head above the water. Everytime a thought, fear or guilt creeps in I bob in the water and feel like I am going under. In the last three weeks I was sinking. I went to the health food store and got some vitamins. We have also had a few sunny days which has helped. We need to pray pray pray against fear and satan's attacks on our mind (easier said than done). Satan did not want me to write this. This is my 4th attempt. My son accidentally deleted it when he came home from school and then while rocking Elise back to sleep for her nap and trying to type I accidentally make it disappear not once but twice! What is that all about?! I am sure it is difficult with hubby working so much, hopefully this is a short season. I recommend leaning on your support system taking some time for just you!! You will make it through this… Praying for you!! I'm not a heart momma, but have stood with two dear friends of mine as their Sweet son has undergone Surgery after surgery with his hypo plastic right heart. I have prayed for so many heart babies in the last 8 years that it truly breaks my own heart. Walking this path with my friends has given me perspective that I wouldn't have had otherwise. My Friend, Amanda Rose Adams has written and published a book, titled Heart Warriors: a family faces congenital Heart Disease. The book is amazing, and deals with a lot of the same issues Krista brings up here. Take a peek, You Are NEVER Alone!!! !